North Korean leader Kim Jong Un said he will leave the dismantling process open to experts and journalists from both South Korea and the U.S.
SEOUL, South Korea — North Korean leader Kim Jong Un has vowed to shut down the country's nuclear test site in May and open the process to experts and journalists from South Korea and the United States, Seoul's presidential office said on Sunday. The event could serve as a dramatic setup to Kim's crucial nuclear negotiations with President Donald Trump that may take place in the next few weeks amid widespread skepticism on whether the North will ever fully surrender its nuclear weapons. Kim made the comments during his summit with South Korean President Moon Jae-in on Friday, where he also expressed optimism about his meeting with Trump, saying the president will learn he's "not a person" to fire missiles toward the United States, senior communications secretary Yoon Young-chan said. 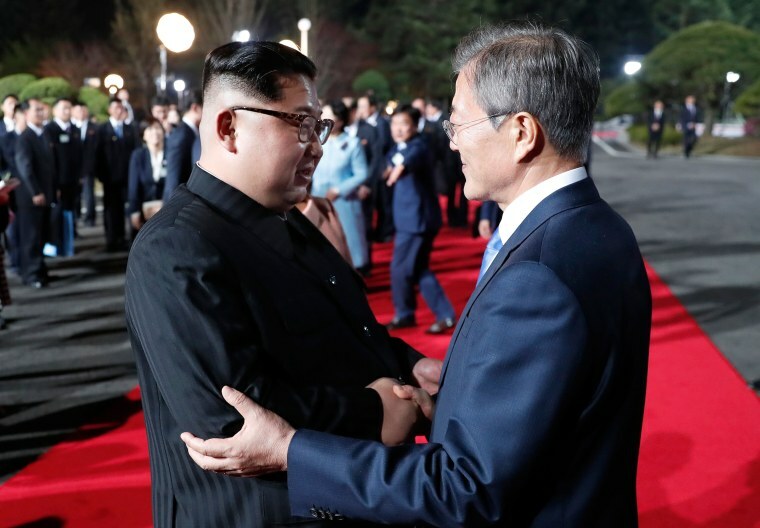 During the summit, Moon and Kim promised to work toward the "complete denuclearization" of the Korean Peninsula, but made no references to verification or timetables. Seoul had also shuttled between Pyongyang and Washington to set up a potential meeting between Kim and Trump, which is expected next month or early June. "Although the United States inherently dislikes North Korea, once we start talking they will know that I am not a person to launch nuclear weapons at South Korea, the Pacific or the United States," Yoon quoted Kim as saying. Also Saturday, Moon took more than an hour to brief Trump on the historic meeting during a lengthy call between the two leaders. Trump congratulated Moon on his meeting with Kim and the "huge progress [made] in the inter-Korean relations," according to a briefing from Moon spokesperson Kim Eui Kyeom. In response, Moon stressed that Trump's "grand determination" has contributed greatly toward the improving relations between the two countries. The two leaders agreed the talks between U.S. and the North must be held as soon as possible in order to maintain the momentum created by Friday's historic summit, Moon's spokesperson said. They reportedly also discussed the pros and cons of the two locations now being considered for the Trump-Kim meeting. Singapore, Switzerland, Sweden and Mongolia have all been previously cited as possible venues. At a campaign rally in Washington Township, Michigan on Saturday night Trump claimed a large measure of credit for the talks held this week. He told the crowd "I had one of the fake news groups this morning, they were saying, 'what do you think President Trump had to do with it?" "I'll tell you what — like how about 'everything,'" Trump said. The crowd cheered. Supporters also chanted "Nobel," referring to the peace prize, and Trump chuckled and said "That's very nice, 'Nobel,'" and "I just want to get the job done." The Friday summit between Moon and Kim kicked off a global diplomatic drive to deal with the North's nuclear and missile threats, which comes after a flurry of weapons tests last year involving purported thermonuclear weapons, developmental ICBMs and quick-fire solid-fuel missiles. There is widespread doubt whether Kim will ever agree to entirely abandon his nuclear weapons when he clearly sees them as providing his only guarantee of survival in a region surrounded by enemies. Yoon said that the North's decision to return to the Seoul time zone was aimed at facilitating better communication with South Korea and also the United States. "I don't know why we keep making things that separate us. We should try to unite," deputy spokesperson Koh Min Jung quoted Kim as saying. Stella Kim reported from Seoul, and Yuliya Talmazan from London.